Courtesy of Vladimir Mravec, VladSwim. Vladimir Mravec is busy in Sydney, Australia preparing for all the swims to be attempted by members of VladSwim. 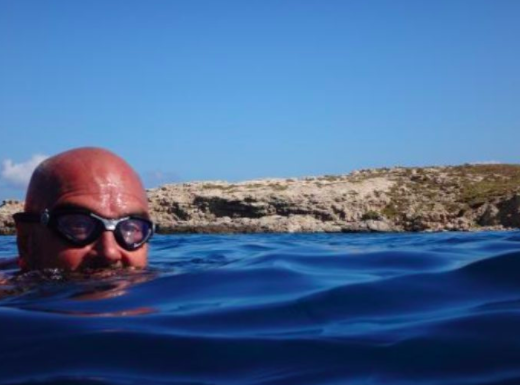 "My swimmers are chasing all channel swims; there is never-ending stories. More and more swimmers want to do long swim challenges. 2017 was a busy year." In the English Channel, successful members included Brendan Maher, Ned Wieland, Anthony Schwager, Peter Shultz, Rachelle Silver, and Zuzana Juskova. In the North Channel, Dean Summers was successful [shown above]. Across the Catalina Channel, Julia Isbill and Michael Teys were successful. In 8 Bridges Manhattan Island Swim, Michael Teys, Emma Radford and Julia Isbill were successful. In the Cook Strait, Marty Filipowski was successful. Plus 28 solo swimmers in the annual Rottnest Channel Swim in Western Australia. Even when the Vladswim members did not make a crossing, they were hanging in tough. Cae Tolman swam 18 hours in the Molokai Channel, but was pulled out. "Overall, we have 6 Triple Crowners and 35 English Channel swimmers. I believe more swimmers will come." For more information, visit www.vladswim.com.au.